Outages are scheduled to begin at 4 a.m. and last an hour, although they could go longer due to unforeseen circumstances. 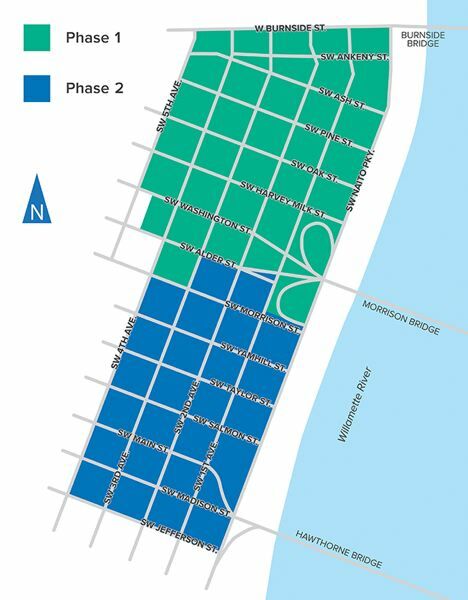 As part of a planned service upgrade, PGE will shut down power to a stretch of downtown Portland along Tom McCall Waterfront Park on March 10 and 24. Preparing for the outages is especially important to anyone living in the area with a medical condition that requires electricity, PGE says. The affected area extends for four and five blocks west Southwest Naito Parkway between Jefferson Street on the south and Burnside Street on the north. Power is planned to be turned off for one hour at 4 a.m. on both days, although PGE says the shutdown could last for as long as five hours due to unforeseen circumstances. Power is scheduled to be shut off between Alder and Burnside streets on March 10. It will be shut off between Jefferson and Alder streets on March 24. The backup day is April 13, starting at 4 a.m. The outages are required as part of PGE's Marquam Substation Project to modernize the downtown power grid. It includes installing new underground cables, requiring that the power be shut down. Construction started in 2017. The project involves building a new substation and installing new underground power lines to replace 60-year-old underground equipment in the downtown corridor. It includes replacing aging power lines with the latest smart grid technologies to develop a more reliable and resilient grid to serve downtown and reduce unintended power outages. In all the locations, drivers, cyclists and pedestrians can expect traffic lane and possible sidewalk closures. Flaggers and traffic cones will be used to redirect traffic.